A cool smooth finish to a dry or wet shave. 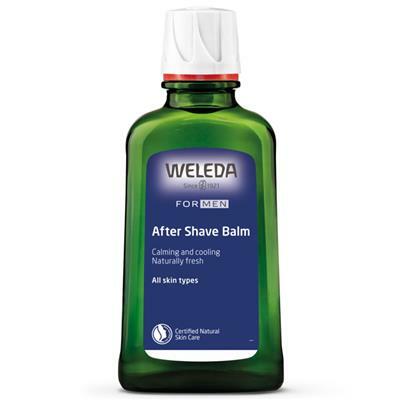 As simple as a splash of fresh water, use this gentle balm on stressed skin after every shave, wet or dry. Shaving puts your skin under pressure, so reward yourself with a splash of gentle balm after every shave. In the bottle we’ve put soothing chamomile, cooling aloe vera gel and organic oils of jojoba and coconut to help build and seal in moisture. The fresh, subtle fragrance comes from aromatic bitter gum of myrrh and natural essential oils. It’s a mix that’s as gentle as it is effective – ideal even for sensitive skin. INCI: Water (Aqua), Alcohol, Simmondsia Chinensis (Jojoba) Seed Oil, Cocus Nucifera (Coconut) Oil, Glycerin, Betaine, Aloe Barbadensis Leaf Juice, Butyrospermum Parkii (Shea Butter), Cetearyl Glucoside, Chamomilla Recutita (Matricaria) Extract, Commiphora Myrrha Resin Extract, Beeswax (Cera Alba), Chondrus Crispus (Carrageenan) Extract, Magnesiuim Aluminum Silicate, Xanthan Gum, Lactic Acide, Fragrance (Parfum)*, Limonene*, Linalool*, Citronellol*, Benzyl Benzoate*, Benzyl Salicylate*, Geraniol*, Citral*, Coumarin*, Farnesol*. * from natural essential oils. Shake well before use. Massage lightly onto face, neck and throat after shaving.